Pale metallics are great colors for these aerodynamic cars, and really highlight their mid-century futuristic design. Interestingly, while these cars were never officially imported to the US, this car may have been federalized – it has blue and yellow Oregon plates, which date back to the 1970s and 1980s, and side marker lights/reflectors. 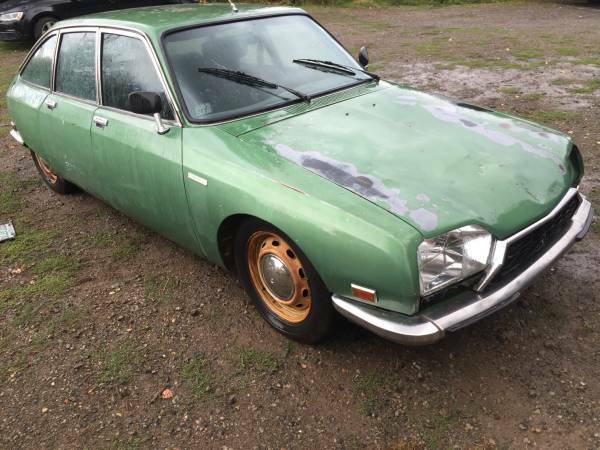 Interestingly, the seller states about 300 were imported into the US, so perhaps a test batch came over, much like Peugeot’s 304. The car appears to have been stored for a long time, and suffers from paint that is faded and worn through, a dented hood, and a missing driver’s headlight lens. These cars are also known for their ability to rust (what 1970s car isn’t? 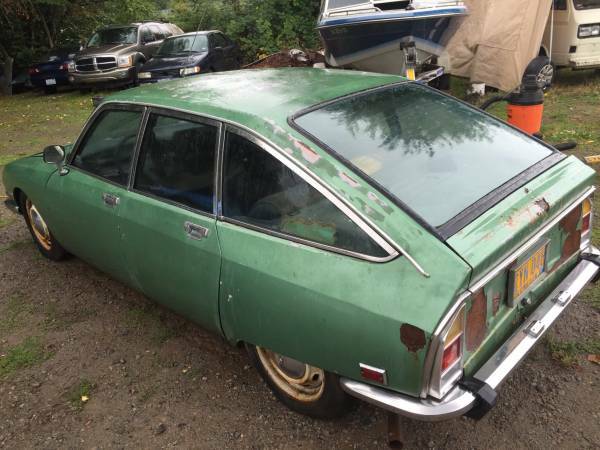 ), and while the seller provides no pictures of critical areas like sills, there is some surface rust visible on the body, and the seller says the body is straight with rust limited to the hatch. The GS is said to have been stored in a barn for 20 years, but supposedly runs well. It’s set up to run on propane – perhaps this was an attempt by a previous owner to skirt emissions rules. Plenty of documentation comes with the car, including a clean title. Being a GS, it will have a weird interior, though not quite as weird as a GSA. As a 1973 model, it should have the 60hp 1222cc engine – not massively powerful, but the engines are said to rev well, and you’ll be too comfortably ensconced in those lovely seats and the amazing ride to care how fast you’re going. That said, as the seller says, it’s a project, so for now you’ll have to spend some time on the hard concrete underneath the car doing a proper restoration. Is it worth it to have one of the most innovative compacts of 1973? This entry was posted on September 30, 2015 at 11:43 am and is filed under Feature. You can follow any responses to this entry through the RSS 2.0 feed. You can leave a response, or trackback from your own site.